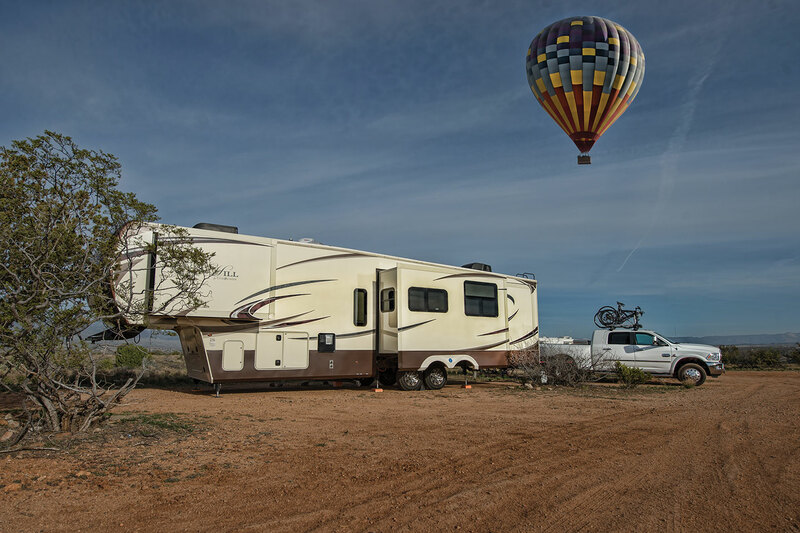 The Braga family found new freedom when they embraced the RV lifestyle. A daughter’s severe food allergies led the Braga family to explore the United States by RV. For many people, RVing is liberating. It offers a break from boredom, workplace stress, cold weather. Jerome and Jen Braga, F477684, and their daughters Leighton, 9, and Shayla, 7, also sought an escape, but for a much different reason. Shayla’s food allergies put her at constant risk for anaphylaxis — severe reactions that can be life threatening. Jerome and Jen own a photography business. They concentrate on weddings and corporate work. Jerome is the lead shooter; Jen handles office duties but also shoots on occasion. About five years ago, the Bragas were hired to do some work on Cape Cod, which is far enough away from their Middletown, Connecticut, home that overnight accommodations were needed. 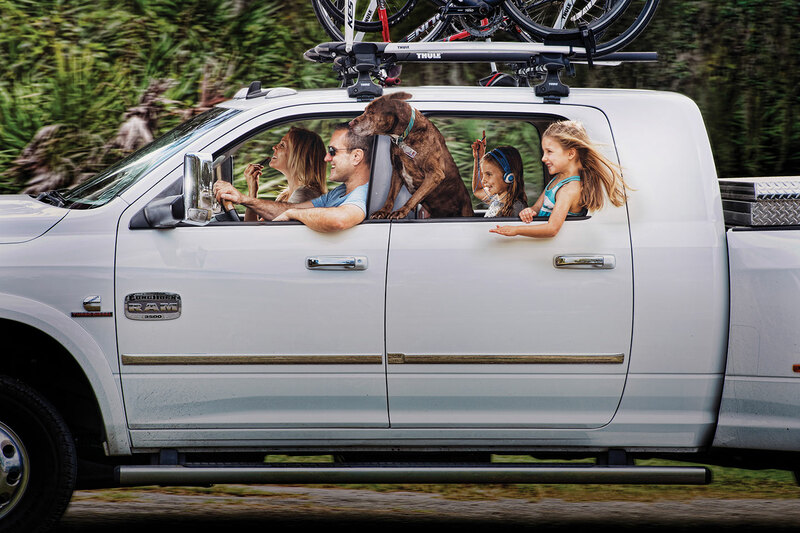 They knew being away from home would mean taking extra precautions to ensure that Shayla avoided dairy, eggs, peanuts, tree nuts, wheat, soy, shellfish, and fish. (She has since outgrown her allergies to wheat and soy, and can now tolerate some fish.) Dairy was then, and still is, her worst allergy, by far. In a hotel room, most people would never notice whether the carpet contained the dust left behind by a cheese-flavored snack. For Shayla, it could be fatal. As an alternative to a hotel, Jerome suggested to Jen that they buy a cheap, 10-year-old travel trailer. 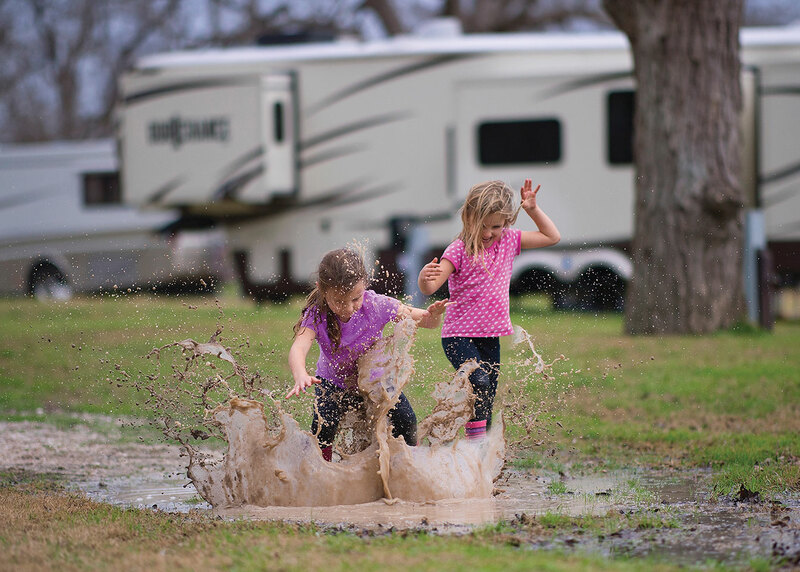 After a couple of days of rain in Columbus, Texas, Leighton (left) and Shayla Braga were allowed to venture outside and splash in puddles. Jerome won her over by noting that they’d have their own shower and kitchen. “Just try it and see if we like it,” he told her. In fact, they all liked it so much that they upgraded to a brand new 28-foot travel trailer in 2014. That summer, the Bragas were invited to another family’s home for dinner. Shayla, then 3, knew she could eat from the bowl of regular Tostitos tortilla chips. But another bowl had been set out for the adults, and it contained Tostitos Hint of Lime chips. They look much the same, but they contain dairy products. “She was one step behind me,” Jen recalled. “She grabbed one chip.” And took one very small bite. Shayla soon turned red, broke out in hives, and struggled to breathe. Jerome and Jen jumped in their car with her. Jen raced to the hospital, which was 20 minutes away, while Jerome, in the back seat with Shayla, used an EpiPen to inject epinephrine into his daughter. Thankfully, it worked. The incident convinced the Bragas that preschool would be too risky for Shayla. They decided instead that home schooling would be best, at least through kindergarten. About that time, the Bragas were dealt other blows. Jen’s best friend died at age 30 after a battle with breast cancer. A mountain biking accident claimed another young friend, who fell into a lake and drowned. And they almost lost a young client who needed a double lung transplant. As the winter of 2015-2016 approached, and with the loss of their friends weighing heavily on their minds, Jerome and Jen discussed taking the girls to Florida for several weeks in December to enjoy life a little more. That meant Leighton would miss considerable time from first grade. Eventually, they decided to home-school both children so the family could travel the entire winter. Then Jerome and Jen looked at their travel trailer and realized it was too small to live in fulltime. The girls needed their own space; the adults needed room to work. So, they bought a 42-foot fifth-wheel and a dually pickup truck to tow it. That winter of 2016, the family spent three months traveling cross-country. They chronicled their adventures on their website, Our1Chance.com. Turns out, it wasn’t their one chance for such a trip. The following year, they leased out their Connecticut home and again traveled across the country, spending five months on the road. When they travel, grocery shopping takes longer than at home, because they must carefully read labels of unfamiliar brands. Jerome and Jen decided long ago that their family would primarily eat what Shayla eats. Jen makes almost everything from scratch. She spends 30 hours a week on food planning and preparation. 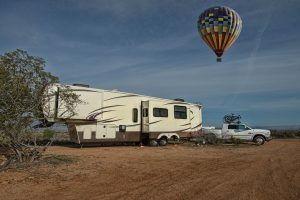 A hot-air balloon paid an early-morning visit to the Braga family’s boondocking spot near Cottonwood, Arizona. Although they have embraced the RV lifestyle, Jerome and Jen still feel some anxiety wherever they go. When invited to another RVer’s campsite, they scan the scene for signs of danger. They must be aware of all the food. Shayla can’t tolerate the smoke from a campfire. She can’t take the risk of entering another RV.